1. They arise from bone marrow, Bursa of Fabricus (in fowl), gut associated lymphoid tissue (Peyer’s patches). 2. B-cells form humoral or antibody mediated immune system. 3. They defend against viruses and bacteria that enter the blood and lymph. 4. The stimulated B lymphocytes produces plasmablast and plasma cells. 5. Plasma cells do not more to the site of infection. 6. Plasma cells do not react against transplants and cancer cells. 7. Plasma cells have no inhibitory effect on immune system. 1. They arise from bone marrow thymus. 2. 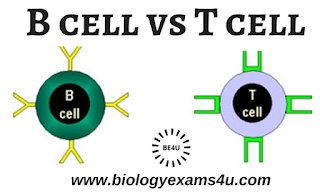 T cells form cell mediated immune system. 3. They defend against pathogens including protozoan and fungi that enter the cells. 5. Some cells migrate to the site of infection. 6. Killer cells react against transplant and cancer cells. 7. Suppressor cells inhibit immune cells.